A new survey shows that while 51% of Americans describe themselves as “pro-choice,” 56% say abortion is “morally wrong” and 76% want “significant restrictions” on abortion. The poll was conducted by the Marist Institute for Public Opinion for the Knights of Columbus, and used the findings of two surveys, one from Dec. 4-7, 2017 and the second from Jan. 8-18, 2018. Marist interviewed 2,617 adults by telephone for the surveys. The margin of error was +/- 2.8 percentage points. The survey showed that 44% of Americans identify as “pro-life” and 51% identify as “pro-choice.” Another 4% are “unsure.” These numbers are essentially the same as they were in October 2008 — 44% pro-life and 50% pro-choice. However, when asked whether they believe that, “in general, abortion is morally acceptable or morally wrong?” 56% said abortion is “morally wrong,” according to the survey. 41% said abortion is “morally acceptable, and 3% said it was not a moral issue. “It is high time that our political debates reflected this national consensus and used it as a starting point,” said Anderson. Other findings from the survey showed that 63% of Americans “support/strongly support” banning abortions after 20 weeks of pregnancy except to save the life of the mother. Also, 64% of Americans believe it is “morally wrong” to abort a child because he or she has a genetic disorder, such as Down syndrome. Only 26% said it was morally acceptable to kill a baby with a genetic disorder. You know, gentle readers, the paradigms through which the Democratic Party chooses their “Moral Causes” to champion baffles this ol’ Southern boy’s sense of right and wrong. As I write this, late on a Dixie Saturday Night, OUR Federal Government has been brought to a standstill by a bunch of self-serving professional politicians. The Dems claim that the shutdown is in defense of DACA, an unconstitutional leftover from the reign of terror that was the Presidency of Barack Hussein Obama. The problem with that claim is that this is a budget issue, not a Domestic Policy issue. The other thing is, those effected by DACA are no longer children. So, follow along with me, y’all. The Democrats are willing to shut down our government and sacrifice winning another Midterm or President Election for decades to come, in defense of the progeny of illegal aliens, who while being brought here as children, are now adults, and are in no way “defenseless” as the Dems claim that they are. Depending on whose information you believe these grown-up “DACA Kids” number between 800,000 and 4,000,000. While Democrats have been taking care of the “DACA Kids” since 2013, 2, 910,870 American Babies were prematurely yanked from their mothers’ wombs, killed without ever given the opportunity to live. It is So, why are the Democrats going to the mat for these illegal aliens and ignoring an American Holocaust? They believe that these grown-up DACA Kids will vote for them. With their Political Ideology presently in a Crash and Burn Mode, they are after all of the potential Democratic Voters that they can scrounge up. If the Dems ever came out against abortion, their friends at Planned Parenthood and their Far Left Base would abandon them they were leprous. It is a lot more politically expedient for Dems to support Amnesty for the DACA “Kids” while ignoring the stain on our country called abortion. The DACA Kids have had the opportunity to grow up and be Democratic Voters. American Babies who have been aborted will never have to opportunity to vote for anyone. However, oddly enough…Democrats do not view abortion as taking away someone’s “rights”, as they claim that “DACA Kids” have suffered through. Have you ever tried to have a discussion with an ardent pro-abortion supporter, either on Facebook or face-to-face? You won’t hear these “Champions of Tolerance” call those innocent lives, babies, human beings, a life, a soul, a gift from God, or anything remotely resembling something that they should feel remorse about killing. Heck, Pro-Abortionists are opposed to the taking of sonograms of the woman’s womb, before she has an abortion. They’re afraid that the “seed-carrier” will realize that IS a HUMAN BEING inside her, and will decide not to kill that baby. As soon as it is born, the child shows in a scientifically demonstrable way that it recognizes its mother’s voice and distinguishes it from that of a stranger. Where has he learned that voice other than in the maternal womb? There are also direct proofs. For example, we register how the movements and cardiac frequency of the fetus vary if we transmit unexpected sounds through the uterine wall. And we see that at first the fetus is startled, then it gets used to it, just like we do when we hear something that does not interest us. In fact, the scientific evidence is immense. We cannot understand how it can be thought that it becomes a person at a certain point, perhaps when coming out of the uterus. From the physical point of view, at the birth very little really changes: Air enters the lungs, the arrival of blood from the placenta is interrupted, the type of circulation of blood in the heart changes, and not much more. As I often say, only blind faith in magic arts or some strange divinity can lead one to think that there is a “human” quality leap at a given moment — certainly not science. There is a curious unique enzyme found in the human body. 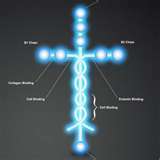 Laminin is defined by the Webster Medical Dictionary as a “glycoprotein that is a component of connective tissue basement membrane and that promotes cell adhesion.” In other words, a glue within the body. As I stated earlier, I believe that the Democratic Party is not presently shutting down OUR Government over some noble moral cause. They simply want more Democratic Voters. The DACA Kids provide that need. There is nothing altruistic about what the Dems are doing. If they wished to be altruistic and noble, the Democrats would agree to defund Planned Parenthood as part of the Budget Compromise. But, don’t go holding your breath waiting for that to happen. Aborted babies can’t grow up to be Democratic Voters.